Left 4 Dead developer Turtle Rock Studios is returning to action with a next-gen multiplayer shooter entitled Evolve. Remember back in May 2011 when Left 4 Dead developer Turtle Rock Studios announced a deal with THQ for a new multiplayer shooter? 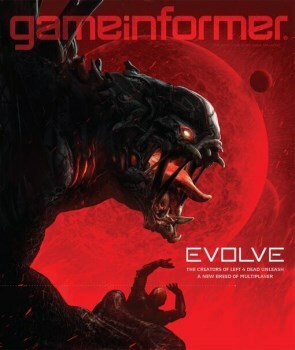 That property ended up in the hands of 2K Games when THQ went under and today has finally been revealed as Evolve, a shooter that pits a team of four human hunters against a single, player-controlled alien that grows more powerful over the course of multiple matches. As reported by Game Informer, each member of the hunter team will have unique abilities and items, while the alien will compensate for the numerical imbalance with size and "an assortment of devastating attacks." There will be more to Evolve than just bug hunts, however, as it will reportedly offer "a novel mix of cooperative and competitive multiplayer elements." Since we don't have anything else to go on just yet, I'm going to imagine that this is essentially Catch the Chicken with an alien twist. Speaking of which, it's hard to overlook the similarity between the alien image on the GI cover and the Alien image at the top of today's Alien: Isolation preview, but pay attention to capitalization and try not to get them confused. Evolve is expected to launch this fall for the Xbox One, PlayStation 4 and PC.